UN - 8 September 2014 – The multiplication of crises affecting children since the beginning of 2014 is creating unprecedented challenges that overshadow progress to date to protect them from the impact of war, a senior United Nations official told the Security Council today. 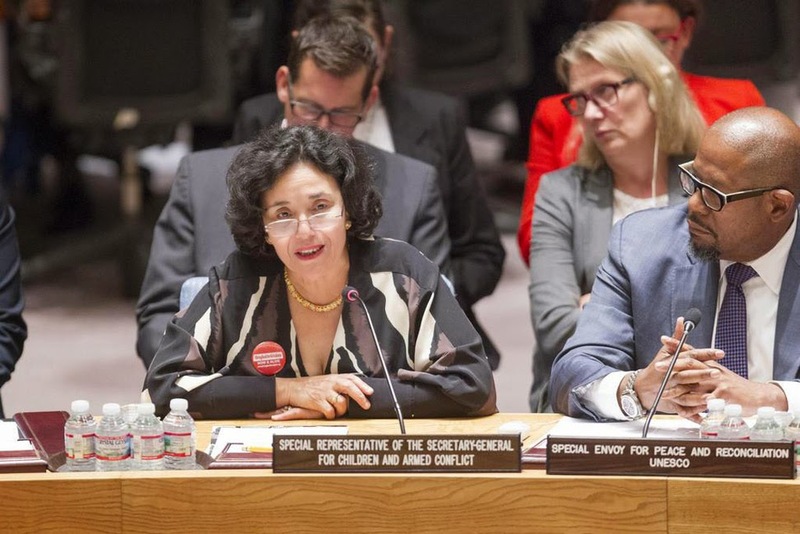 The Secretary-General’s Special Representative for Children and Armed Conflict, Leila Zerrougui, said that she was appalled by the total disregard for human life shown by extremist armed groups such as the Islamic State of Iraq and the Levant (ISIL) and Boko Haram. The situation also remains dire in Syria, she said as she presented the Secretary-General’s latest report on children and armed conflict. “ISIL has tasked boys as young as 13 to carry weapons, guard strategic locations or arrest civilians. Other children are used as suicide bombers,” said Ms. Zerrougui. According to UN monitoring, up to 700 children have been killed or maimed in Iraq since the beginning of the year, including in summary executions. Meanwhile, Boko Haram has attacked schools, leading to the death of at least 100 students and 70 teachers in 2013. Over 200 girls abducted by Boko Haram in April are still missing, while the armed group continues to attack and kidnap other children. In Gaza, over 500 children were killed and more than 1,300 injured, Ms. Zerrougui said, calling for a thorough investigation of the impact of the war on children. Thousands of displaced families are still living in schools and access to education for the children of Gaza is expected to remain limited. At least 244 schools were damaged or destroyed by Israel’s armed forces during recent fighting. “We cannot afford impunity in the face of such grave violations of international law that in some cases may amount to war crimes,” said the Special Representative. Many other situations witnessed grave violations against children in 2013 and face similar challenges today. Instability and rising tensions in Libya, Afghanistan, the Central African Republic, Mali and South Sudan continue to threaten children. The Government of Chad has already fulfilled all the requirements and pledged to prevent the recruitment of children in its armed forces. In May, Yemen became the 7th country to sign an action place. Progress has also been achieved in South Sudan, Somalia, Afghanistan, Myanmar and the Democratic Republic of Congo. “Longstanding peace will never be achieved without giving the children the means, skills, and education to re-build a society and institutions torn by armed conflict,” Ms. Zerrougui said, stressing that more must be done to include special provisions for children affected by conflict into peace agreements. Hervé Ladsous, Under-Secretary-General for Peacekeeping Operations, stressed that coordination of action with international child protection partners was instrumental in addressing the plight of children. Establishing partnerships with States in which UN peacekeeping operations are deployed was also important because States hold the primary responsibility of protecting children. The Department of Peacekeeping Operations (DPKO) would spare no efforts to promote the Children, Not Soldiers campaign and support the Governments and security forces of Afghanistan, Sudan, South Sudan, and the Democratic Republic of the Congo to be free of child soldiers by 2016. But beyond the campaign, Governments must also set the example and support access for monitoring, assistance, and engagement with armed troops, he noted. When negotiating ceasefires, States must prioritize the inclusion of non-negotiable child protection provisions in all agreements. Robust action against armed groups holding child soldiers has also taken place, Mr. Ladsous said. To this end, a specialized training unit on child protection for the military has been developed and shared with countries contributing troops to UN operations. Also briefing the Council was Forest Whitaker, Academy award-winning actor and Special Envoy of the UN Educational, Scientific and Cultural Organization (UNESCO) for Peace and Reconciliation, who returned yesterday from South Sudan. “After meeting with generals on the ground, soldiers and civilians, I fear that there is no end in sight to the violence,” Mr. Whitaker said, describing a scene of thousands of civilians seeking shelter in over-crowded camps because they are too afraid to go back home. In the protection camp in Bentiu, he reported, malnutrition is causing some children’s hair to turn red. Throughout the country, hundreds of schools are empty and some have turned into military camps, as thousands of young people go without food. “Perhaps worst of all, walking through the cities, I saw child soldiers wearing military uniforms and carrying guns,” Mr. Whitaker said. In Uganda, he said the Lord’s Resistance Army would kidnap children from their villages, forcing them to kill those they loved. In some cultures, being a soldier is seen as a rite of passage, and many children join for the honour of supporting their tribes. “We may take a child out of an army, but unless we do more for him – help him re-enter society, enrol him in a good school, teach him a useful trade – we have not set him free,” said Mr. Whitaker.